65 Chessington section 😉 , Stupid to be honest dumping the 25 day service at Holborn Circus at least Tottenham Court Road or even Holborn Station would more suitable . Yes but that 65 thing is an aberration that has not been repeated. 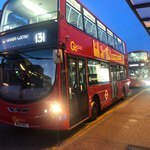 There are 11 routes in the North East London section, how many will be changed ? Indeed. I expect TfL will want to release all three consultations results - East / South East / West - at the same time. Worse there is also a dependency on Oxford St / Emerging Central London route massacre / Hammersmith Bridge schemes too. Some of those have not reached consultation yet but have dependencies in terms of Crossrail changes needing vehicles released and / or being a first stage for later schemes. Much of the Crossrail East London stuff in South Newham is a first stage to a future Silvertown Tunnel network. Whilst I can see some use in the diverting the 115 via Whitechapel station it will add more buses to an already busy stretch of road with the 25, 205 and 254 already jostling for space. Can't decide if this is a good change or not. Did notice when I re read the consultation that the 174 is proposed to go to every 6 mins. I can see that very quietly being dropped and wait to see demand. Should the 115 and 174 actually get the Go Ahead I wonder where the buses will end up coming from. The 115 will need a few extra buses and the 174 will need a handful more as well. 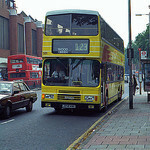 Not to mention the 256s double-decking as I don't know what buses Stagecoach have lying around that they could use. The only option I can think of there is the 256 using the 55/06reg Tridents from WH temporarily until the 262/473 loss releases the Scanias which could probably go on for another two years. There are the 6 buses spare from the 472 reduction (possibly 7 if it needs less spares) which could be used on both routes. The 256 will probably need a new batch either new or like said Scanias from the 262/473. Thou the part 262 will free up 3 E40Ds that could be used. A simpler solution to 115 change could be to simply introduce bus stops on the D3 route at Whitechapel Station. The purpose of the 115 diversion is presumably to link the Elizabeth Line at Whitechapel towards Stepney and Limehouse. Areas on the 115 beyond Limehouse will be closer to Canary Wharf (or even Custom House or Stratford). The D3 serves some similar areas to the 115 towards Limehouse - and would also link Crossrail to areas around Shadwell and Wapping (which may not be directly close to the Overground stations there). The D3 already operates very close to Whitechapel station, but does not stop close enough for easier interchange. Improving connections to the Royal London Hospital may also be a factor in the proposal. 7 buses get freed up by the -6 PVR decrease as the PVR drops below 20 so only two spares are required. Also, I believe the three 262 Enviro 400's moved to the 474 when Stagecoach took over with the 262 taking 3 Tridents instead so they should be free in August roughly which is the latest date I've heard for the Smart hybrids to arrive. As for the 115 not sure where they will clear from but I'm sure a small reduction of other services will free up a few for it and the 135. I believe the 678 is allocated 3 E400s on paper too so these could be swapped with Tridents or Scanias too. I meant maybe now tfl will wait for Crossrail to start and if the 174s end up rammed they may increase the freq.